The wood for this piece was purchased in Alaska from John Hartvigson's woodworking store. John was my "wood pusher" when I lived up there and sometimes found delicacies like this and offered them to the deprived locals who got tired of turning birch. I had never seen wood that was both spalted and highly-figured although I don't know why—the organisms that do the spalting probably don't have much idea about the appearance of wood that is their meal/home. The figure in the bowl is, if anything, more intense than I was able to photograph but this picture of the bottom comes close. It is equal to what I expect to find on a great guitar back. Finish on this piece is boiled linseed oil to pop the grain sealed with blonde shellac and Briwax. The inside of the rim was accented with black dye. 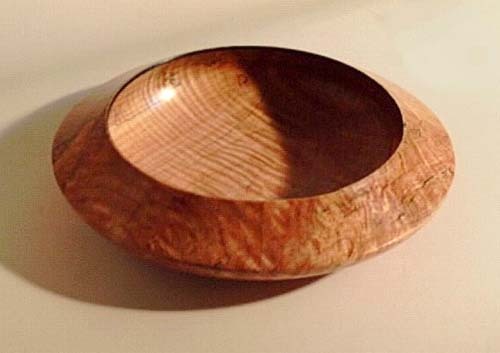 Overall size in inches: 11¾ Diameter X 2½ High.